The smart forfour is the first car in its segment to combine the functionality of a small car with the emotional appeal of a young car brand. Thanks to its flexible interior, the sporty four-seater is extremely versatile, clearly illustrating that the core brand values of innovation and functionality are consistently implemented by smart. 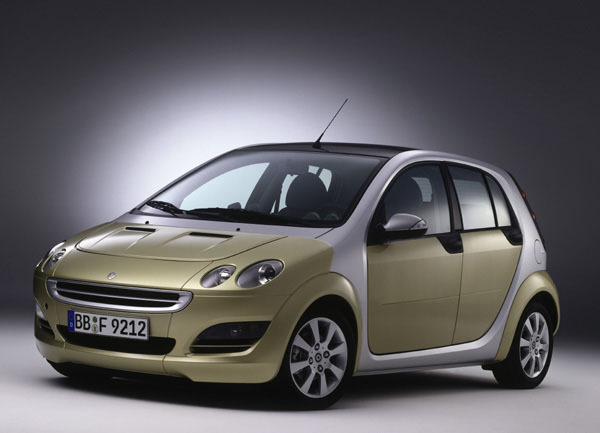 The smart forfour will go on sale in the spring of 2004 starting at a net price of approximately E 11,000 in the euro countries. The proportions of the smart forfour are typical of the smart brand. The car is compact and sporty with its extremely short overhang at the rear and large wheels flush-fitted with the wings. 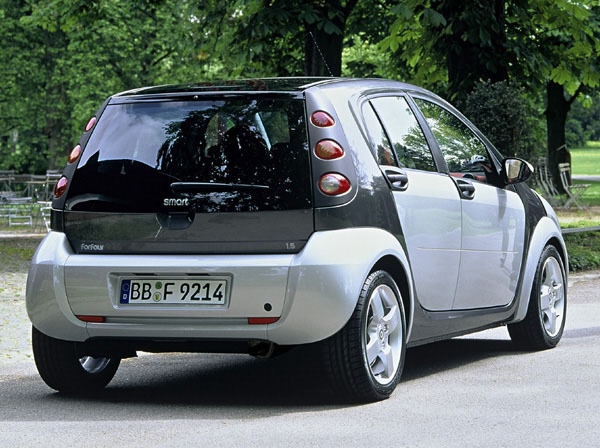 In all variants of the smart forfour, the body has four side doors and a tailgate. The smart forfour is a car with a concept and design which clearly sets it apart from other vehicles. The smart forfour stirs emotions and conveys a sense of joie de vivre. However, above all, it is the first car in the small car segment to offer high-end technology components to customers who are looking for a premium product. The affiliation with DaimlerChrysler and the Mercedes Car Group is particularly apparent in the Electronic Stability Programme supplied as standard, the range of audio, navigation and telecommunication technology and the numerous comfort and safety functions. All smart forfour models are equipped with the Electronic Stability Programme (ESP) as standard and have disk brakes on both the front and rear axle. Whereas other manufacturers in the small car segment do not offer this dynamic handling control system at all, or if they do, it is usually subject to an extra charge, ESP is part of the basic equipment of the smart forfour. With a choice of powerful engine versions and the exceptionally agile set-up of its active drive chassis, the smart forfour meets all the expectations of those looking for a great driving experience. Weighing in at less than 1,000 kilograms, the smart forfour offers a power/weight ratio of up to 12.2 kilograms per kilowatt (9 kg per bhp), which is comparable with the attractive ratio of the smart roadster and roadster-coupe. Customers can choose between three petrol and two diesel variants, as well as two design and equipment lines (pulse and passion). The smart forfour comes with a conventional five-speed manual transmission as standard. The newly developed, automated six-speed transmission softouch plus is available as an option. Despite its compact exterior dimensions, the interior of the vehicle conveys a feeling of spaciousness which is typical of the smart brand. The lounge concept, which is available as an option, lends the interior of the smart forfour a veritable living room feel: The backrests of the two front seats can be folded down so that they are almost level with the rear seats to create a large horizontal seat surface. As with the smart city-coupe, customers can choose between a plastic roof, a panorama glass roof and an electric glass sunroof for the smart forfour. Like all smart models, the smart forfour has a modular safety system and constructional provisions for maximum passenger safety. In crash tests, the five-door smart displayed qualities which go far beyond the legal requirements and meet the extremely high DaimlerChrysler standards. The smart forfour is the first car in its segment to combine the functionality of a small car with the emotional appeal of a young car make. Thanks to its flexible interior, the sporty four-seater is extremely versatile, clearly illustrating that the core brand values of innovation and functionality are consistently implemented by smart. 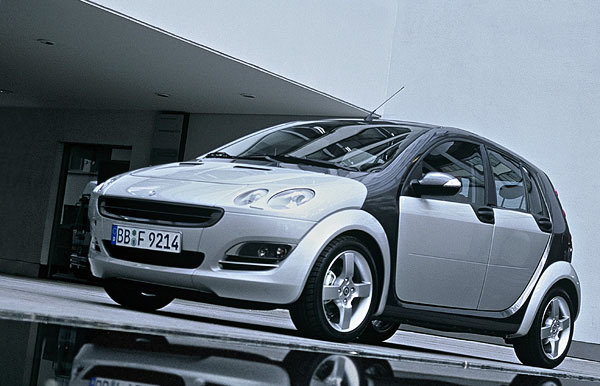 The smart forfour will go on sale in early 2004 starting at a net price of approximately E 11,000 in the euro countries. The smiling face of the smart forfour is characterised by the four individual vertically mounted headlamps, positioned at an angle to each other above the air inlet. At the rear, the three-dimensional round taillamps are typical of the smart brand. On the smart forfour they are positioned above one another in the C pillar with a plastic surround. The side indicator lamps are located in the door mirror housing. As with the smart city-coupe, cabrio, roadster and roadster-coupe, a choice of design and equipment variants is also available for the smart forfour. The “pulse” line offers a full range of high-quality features as standard, whereas the second equipment line “passion” caters to the highest comfort requirements. Three colours are available for the tridion safety cell and these are complemented by bodypanels in eight typical smart colours which can be selected for all equipment variants. The lounge concept, which is available for both variants as an option, lends the interior of the smart forfour a veritable living room feel. The backrests of the two front seats can be folded down so that they are almost level with the rear seats to create a large horizontal seat surface. Lounge pads with a matching trim extend the seat backs of the rear seat bench at the sides and give them a rounded finish at the rear side doors. While the passengers in the smart forfour relax, they can use the foldable and axially rotatable “twinface” multifunctional armrest located between the front seats as either a storage compartment or a cup-holder. The multivariable rear bench of the smart forfour can be adjusted by 150 millimetres in length. 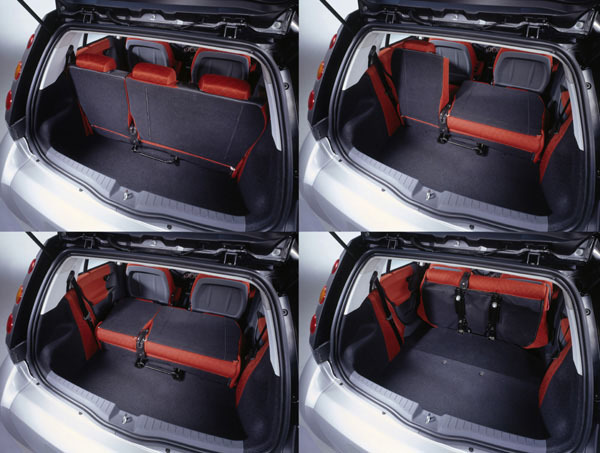 This maximises the space available for either the rear passengers or for luggage stowage space. The rear seat back is divided up in the ratio 60:40 and each part can be reclined separately. If desired, comfort levels can be increased by a central armrest which is integrated into the backrest as well as by “sofa cushions” which match the interior trim. The standard rear seat bench is designed for two people but a version for three rear seat passengers is also available at an additional charge. In order to ensure the same level of safety for the fifth passenger on the three-person rear seat bench, it is equipped with a third headrest and an integrated three-point belt. On the other hand, in the event that additional room is needed for a large amount of luggage rather than rear-seat passengers, the folding mechanisms enable you to fold the backrests forwards - either individually or together - into a horizontal position and to fold the entire rear seatback into a vertical position. In the middle position, the luggage compartment holds just under 270 litres. By folding down the rear seatbacks or folding forward the seat system, this can be increased to a volume of up to 620 or 910 litres. Despite its compact exterior dimensions, the interior of the vehicle conveys a feeling of spaciousness which is typical of smart. One of the main reasons for this is the double-curved dashboard which conveys a light, freely suspended impression. The three-dimensional appearance is also enhanced by the spherical external-mounted air vents and the textile sections integrated in the plastic surfaces. The same effect is created by the centre console, in which an array of control elements are integrated. The interior of the smart forfour is rounded off by a characteristic steering wheel with a three-spoke design. The covering varies according to equipment line - plastic for “pulse” or leather for “passion”. In addition, a multifunctional steering wheel with two double spokes featuring push buttons is available as an option. These push buttons can be used by the driver to control a variety of functions - radio, CD player, mobile telephone and the audio and command systems - without having to take his or her hands from the wheel. 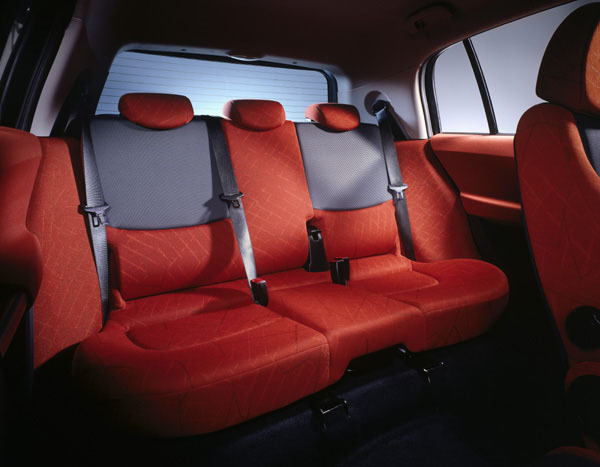 For the interior features of the smart forfour, a total of four upholstery fabrics are available in different colours and patterns, with exquisite leather trim completing the range. As with the smart city-coupe, customers can choose between a plastic roof, a panorama glass roof and an electric glass sunroof. The plastic roof with a grained surface is a standard feature in the pulse line, whereas the passion models are equipped with a panorama glass roof. A sliding glass roof is available as an option for both equipment lines. 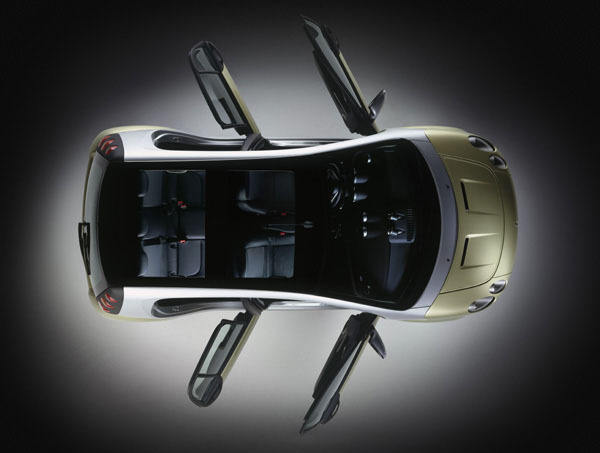 The panorama glass roof, which is a standard feature of the passion line and available as an option for the pulse, measures 1.4 m2 and allows extra light into the interior of the smart forfour. In addition to the tinted transparent glass, a two-part sun-blind located on the inside of the car helps keep out unwanted sunlight. The electric sliding glass roof ensures that you always have ample light and fresh air in the vehicle. It can be opened in any position at the touch of a button. If you like a constant supply of fresh air in the cockpit but want to keep out the sunlight, you need look no further than the interior sun-blind. The taut plastic fabric does not flutter at high speeds and so does not cause disturbing noise. With a choice of powerful engine versions and the exceptionally agile set-up of its active drive chassis, the new smart forfour meets all the expectations of those looking for a great driving experience. Weighing in at less than 1,000 kilograms, the smart forfour offers a power/weight ratio of up to 12.2 kilograms per kilowatt (9 kg per bhp), which is on a par with the low ratio of the smart roadster and roadster-coupe. The steering of the sporty four-seater is very responsive and can take fast bends with minimal lateral inclination. The roll angle of the smart forfour is also at the low level of the smart roadster and roadster-coupe. The wide track width - 1,460 millimetres at the front and 1,445 millimetre in the rear are decisive for this - along with the spring and shock absorber settings. With a total spring travel of 170 millimetres at the front and 180 millimetres at the rear, the smart forfour has ample reserves for coping with bumpy roads, ensuring a comfortable ride for the passengers at all times. A total of five powerful engine versions are available for the smart forfour: Besides two diesel engines with three cylinders, a capacity of 1.5 litres and 50/70 kW power output, three petrol variants are also available. These have an engine capacity of 1.1 litres, 1.3 litres and 1.5 litres along with a power output of between 55 kW and 80 kW. The 1.1 litre engine is designed for three cylinders and the other two are four-cylinder models. All engine versions comply with the limit values set out in the EU4 exhaust directive, thus entitling owners resident in Germany to tax exemption for two years. The new family of petrol engines, which was specially created for the smart forfour, is the result of cooperation between DaimlerChrysler and Mitsubishi. The petrol engines are produced in the MDC Power engine factory in Kolleda (Thuringia), which was specially constructed for this purpose. Both diesel engine versions are identical from a mechanical perspective, whereby the 50 kW version was derived electronically from the 70 kW variant. Both diesel engines are built by DaimlerChrysler in Stuttgart-Unterturkheim. Available on request for all smart forfour models, the sports package ensures an even more dynamic driving experience and a suitably sporty look. Included in this sports package are a lowering kit and 6.5 x 16 wheels. Added to this are blue-tinted windows and a leather steering wheel and gearshift knob, all of which combine to lend the smart forfour an additional sporty touch - both inside and outside. All smart forfour models are equipped with the Electronic Stability Programme (ESP) as standard and have disk brakes on both the front and rear axle. ESP uses selective brake intervention to stabilise the vehicle. In addition, ESP offers a Hydraulic Brake Assist and a differential lock function. Furthermore, the Anti-lock Braking System ABS including Electronic Brake-force Distribution is integrated in ESP. ESP ensures that the smart forfour always follows the direction in which the driver steers, even at the stability limit of driving dynamics. In addition to closing the throttle valve, ESP also features selective brake intervention acting on individual wheels. This ensures directional stability and road adhesion when accelerating, braking and coasting. All versions of the smart forfour are equipped with Electric Power Steering. This leads to a notable increase in steering comfort as well as a significant reduction in the effort required to turn the steering wheel, particularly during manoeuvring. At the same time, Electric Power Steering offers considerable advantages over conventional electro-hydraulic systems in terms of weight, required space and fuel consumption. The lanechanger function for the indicators contributes to road traffic safety and convenience. Briefly pressing the steering column control stalk makes the selected direction indicator flash three times. The smart forfour comes with a conventional five-speed manual transmission as standard. The automated six-gear transmission softouch plus is available as an option. In this case, the smart forfour does not require a clutch pedal, as an electric motor opens and closes the clutch. With this automated transmission, the gearshift lever also allows manual gear shifting - it is pushed forwards to change up gears, and backwards to change down. Additional shift paddles integrated in the steering wheel are available as an option: In this way, the driver can keep his or her hands safely on the steering wheel when changing gear. The shift paddles are located on the back of the steering wheel at both sides - the right-hand paddle is used to change up gears and the left-hand one to change down. Another standard feature is the kickdown function, which allows the driver to change down one or two gears spontaneously using the accelerator pedal. As well as this, the automated transmission of the smart forfour features a crawl function. This makes it possible to drive slowly without pressing the accelerator pedal - not unlike an automatic transmission with a torque converter. The gentle acceleration makes hill starts, parking, or rolling in stop-and-go traffic easier. The pulse models come with 175/65 R 14 T tyres, except for the 1.5 litre petrol version which is fitted with 195/50 R 15 tyres. These are mounted on 5.5 x 14 or 5.5 x 15 steel wheels. The passion models are factory-fitted with 6 x 15 light alloy wheels and 195/50 R 15 H tyres. Light alloy wheels of this size are available as an option for pulse models. Light alloy wheels (6.5 x 16), which require 205/45 R 16 H tyres, can be ordered for both lines as an option. The rigorous and clearly defined control of all product brands is a significant strategic premise at DaimlerChrysler. Within the group portfolio, the focus of the smart brand - as a part of the Mercedes Car Group - is on exceptional vehicles in the small car segment. The smart developers and designers have the task of implementing the technical expertise and pacemaker function of DaimlerChrysler in the small car segment. This means that the basic demands made on all products of the Mercedes Car Group are identical, even though their characteristics may differ considerably. These standards were also of fundamental importance in the cooperation with Mitsubishi: Despite the high value of the shared parts, smart developed a car with a concept and design which is radically different from the Mitsubishi brand. The smart forfour stirs emotions and conveys a sense of joie de vivre. Its power/weight ratio and also the handling are on a par with the high levels of the smart roadster and roadster-coupe. However, above all, it is the first car to offer high-end technology components to customers wanting a premium small car. Features of the smart forfour which stem from Mercedes are the audio and command systems, a multifunctional steering wheel, the rain and light sensor and the locking system (incl. drive lock). The smart forfour and the Mitsubishi “New Compact Car” are the first non-Mercedes-Benz cars to be jointly based on the DaimlerChrysler electrics and electronics platform. This includes the ABS Anti-lock Braking System, Hydraulic Brake Assist and the crawl function of the automated transmission. Both vehicles are fitted with diesel engines from the DaimlerChrysler plant in Stuttgart-Unterturkheim. The typically smart product characteristics ensure that the smart forfour is also immediately identifiable as belonging to the smart brand. First of all, this is due to the tridion safety cell with a consistently and effectively implemented safety concept, as well as the visible frame structure of the vehicle. 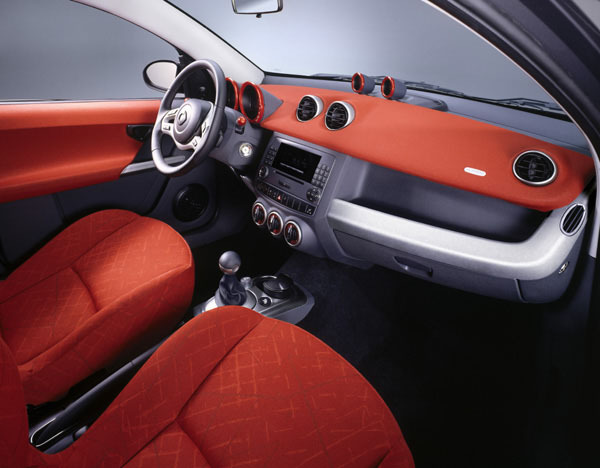 Another unique feature is the two material and two colour concept associated with the tridion safety cell, which is characterised by the use of coloured and interchangeable plastic bodypanels. Besides this, the smart forfour is also characterised by its modular construction which brings advantages in terms of production and ease of assembly. Equally typical of smart is the innovative design which offers a functional and innovatively designed interior with a sense of spaciousness which belies its compact dimensions. And of course the unmistakable smart driving pleasure which the smart forfour conveys - just like all the other vehicles of the brand. The unique smart design pervades every inch of the vehicle - not just the whole exterior with the tridion safety cell and bodypanels, innovative roof systems, headlamps, taillamps, doors and wheels. The interior is also unmistakably smart, both in terms of appearance and functions: The cockpit and instruments bear the mark of the smart designers, as do all control elements and trim parts. In the development of the front axle, with the design of the anti-roll bar, shock absorbers and damper struts smart has achieved a high level of active safety and exceptionally sporty driving dynamics, which puts the smart forfour streets ahead of other vehicles in its segment. Further equipment such as the integrated three-point belt for a fifth passenger as well as side airbags (standard) and window bags (option) make it clear that the smart forfour meets the highest standards when it comes to passive safety. The shared components developed by Mitsubishi include the petrol engines built at MDC Power in Kolleda (Thuringia), the rear axle, structural components in the vehicle underbody, the manual transmission and the emission and fuel tank system. These components were also produced strictly in accordance with smart standards in terms of technical and product specifications. Both vehicles will be built at NedCar in Born (Netherlands). The affiliation with DaimlerChrysler and the Mercedes Car Group is also apparent in the Electronic Stability Programme supplied as standard, the range of audio, navigation and telecommunication technology and the numerous comfort and safety functions. With the arrival of the smart forfour, the small car segment is being treated to the kind of features which were formerly reserved for high-end vehicles. ESP uses selective brake intervention to stabilise the vehicle. In addition, ESP offers a Hydraulic Brake Assist and a differential lock function. Furthermore, the Anti-lock Braking System ABS including Electronic Brake-force Distribution is integrated in ESP. An optional feature available for the smart forfour is a multifunctional double-spoke steering wheel featuring pushbuttons, based on the same operating concept found in Mercedes-Benz vehicles. The multifunctional steering wheel allows the radio, CD player, mobile telephone or navigation functions to be operated without the driver having to take his or her hands from the wheel. With this integrated communication control system, the smart forfour offers a feature typical of the premium end of the vehicle market. The audio, navigation and telecommunications systems also stem from Mercedes-Benz: The range of equipment includes Audio 5 with AM/FM receiver as well as CD and telephone input for retrofittable hands-free equipment. Besides radio and CD drive, Audio 20 offers a keypad for dialling mobile phone numbers and composing text messages. In addition to the functions already mentioned, Audio 50 includes a navigation system which depicts the route using arrows on a 4.9 inch colour display. An integrated WAP browser enables mobile internet access via the smart portal. The most exclusive variant is the Comand System. As well as complex audio, video and telephone functions, this option includes a navigation system with map representation on a coloured display field, not to mention a DVD and CD player. Also available as an option for the smart forfour: Besides the hands-free telephone function, “smart webmove” - smart’s own mobile communication system with its integrated smartphone - now offers a new dynamic offboard navigation system along with an MP3 player linked to the smart soundsystem. The smart forfour sound experience is provided by an interior sound system, which consists of either two or four full-range loudspeakers. The individual converters are located in the front doors, or in all four doors depending on the number of loudspeakers. The most exclusive option is a multichannel system with tweeters in the mirror triangles, low-mid-range speakers in the front doors and wide-band loudspeakers in the rear doors plus an active subwoofer with 2x40 watt power output and active filters under the driver’s seat. A sensor system is available as an option for the smart forfour, allowing windscreen wipers and driving lights to be activated automatically (rain and light sensor). As soon as water hits the windscreen, the rain sensor activates the wipers at an appropriate speed which is determined by the level of rainfall. These sensors are located in the area behind the interior mirror. When the front windscreen wipers are activated and reverse gear is engaged, the rear wiper switches to intermittent mode. The light-on function switches on headlamps and taillamps automatically when darkness falls. Two sensors are responsible for switching the driving lights off and on automatically. One of these registers the ambient light at a wide angle, while the other does likewise in a narrow sensor field. The sensors switch the driving lights on when both register darkness concurrently. For example, this ensures that the lights are switched on when the car enters a tunnel, while also making sure that they remain inactive when driving through an avenue. Once the car is in motion, the central locking system is activated. This system, which is called “drive lock”, protects the passengers in the smart forfour from “uninvited guests”. As soon as a door is opened from within, the central locking system releases all locks again. If desired, drive lock can be deactivated at the touch of a button, also when the vehicle is in motion. When the ignition is switched off at the end of a trip, the headlamps are automatically switched off as well. Conversely, turning the ignition key activates the (switched on) driving lights; however, in order to protect the vehicle power supply, not during the starting process. A further function lights up the way from the car to the front door of the house, for example. Both driving lights and parking lamps are switched on again when the vehicle is locked if the lights were on before the ignition key was removed. After twelve seconds the lights automatically switch off again. Conversely, a double click on the door unlocking button activates the exterior and interior lighting of the smart forfour. The smart forfour is an unmistakable representative of the smart brand. Its identity is underlined first of all by the two material and two colour concept together with its modular construction. TThe steel tridion safety cell forms the outer skin of the smart forfour in the area of the side skirts, A pillar and C pillar and roof bars. The tridion safety cell is a three dimensional structure which surrounds the passenger cell and visualises the modular design of the smart forfour. Together with the plastic bodypanels, the tridion safety cell forms a vehicle body with a design which exudes robustness and suitability for everyday use. In this respect, the bodypanels prove their worth in particular in the event of minor parking bumps - as these leave the bodypanels unscathed. 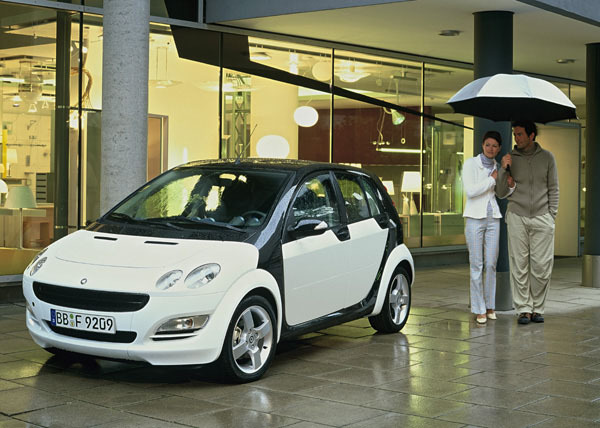 The proportions of the smart forfour are also typical of the smart brand. The car is compact and sporty with its extremely short rear overhang and the large wheels flush-fitted with the wings. In all variants of the smart forfour, the body has four side doors and a tailgate. Like all smart models, the smart forfour has a coordinated, modular safety system and constructional provisions for maximum passenger safety. In crash tests the five-door smart has demonstrated qualities which go beyond the legal requirements and fulfil the high DaimlerChrysler standards. The tridion safety cell, a typical feature of the smart brand, has been modified for the smart forfour. High stability for the passenger cell was achieved by the use of parallel side members running under the whole vehicle floor from the front to the rear. Together with the solid sill sections, these ensure the necessary high degree of rigidity which has an extremely positive effect both when driving on rough roads and in the event of an accident. In addition to the full-size airbags which come as standard for driver and passenger, side airbags are fitted in the backrests of the front seats in all models. Additional window bags can be fitted as an option. In order to reduce the risk of injuries caused by penetration of the steering column into the passenger space, the steering column is collapsible and retracts towards the front in the event of a frontal collision. The decoupling of the brake pedal when high pressure is applied to the footwell structure also greatly reduces the risk of injury in this area. Soft and large contact areas in the interior, for example in the side doors or the cockpit also ensure maximum occupant safety. All seats in the smart forfour have a three-point seat-belt system and headrests. Pyrotechnic belt tensioners and mechanical belt-force limiters are provided for the driver and front passenger. The seat-belt for the rear centre passenger uses a special system: Its inertia-reel mechanism is anchored to the backrest for optimal belt geometry. The doors made of extruded aluminium sections and aluminium sheets with plastic panelling are also a typical smart construction. Sturdy alloy side members together with solid locks and hinges ensure high resistance against intrusions, especially in the event of side crashes, and a secure connection of the door and the passenger cell. Special seat and restraint systems are available for young passengers to suit each age group. 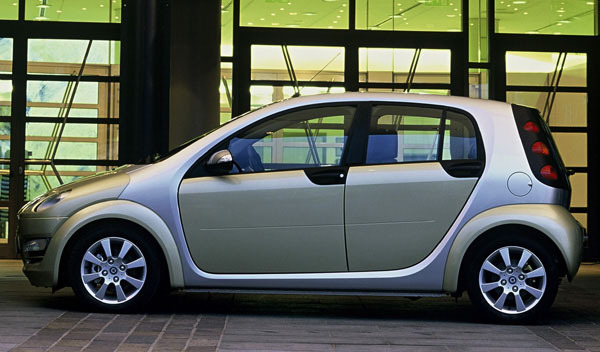 They have proved their suitability in crash tests carried out by smart. A baby seat is available for babies and small children up to 9 months of age. This can be fastened to the seat with the three-point seat belt. If the baby seat is installed on the passenger seat, the appurtenant front airbag can be deactivated with the car key. The seat for children aged between nine months and four years can be attached with both the car’s own three-point belt and also with the Isofix child seat fastener. The Isofix attachment points are located in the outer places on the rear seat bench. There are cutouts in the seat fabric and upholstery which enable the child seat with its Isofix fasteners to be securely and quickly attached to the car. The seat booster for children between the ages of four and 12 years also uses the three-point belt system integrated in the car. The height-adjustable backrest with belt guide ensures that the seat fits the child’s body.